2 What Is the Opinion of Research on the Effects of Vicks Vaporub on Toenail Fungus? 3 How Frequently Should It Be Applied? 4 When Will I Start Seeing the Results? 5 Can Vicks Vaporub Be Used During Pregnancy? About 10% of individuals belonging to all age groups and about 50% of individuals aged 70 years or older suffer from fungal infection of the toenail. Also referred to as onychomycosis, the bed of the nail is infected by the fungus causing thickening and discoloration of nail. Due to the thickening the nail may be pushed away from toe, resulting in nail loss. People suffering from toenail fungus are on the lookout for remedies available at home to treat their painful and odorous infection. Such individuals are curious to know the link of Vicks vaporub and toenail fungus. These are all essential oils, which have been utilized in indigenous cultures since centuries for the treatment of nail fungus, ear infections, athlete’s foot, hemorrhoids, etc. The best part of these oils is that they do not cause any side effects as is caused by other conventional treatments of nail fungus. For instance, prescription drugs for nail fungus can cause serious adverse effects including liver damage and even death. Vicks vaporub is completely free of side effects for majority of the individuals. However, a chance of allergy or adverse reaction to certain ingredients always exists; hence, it is recommended to consult your physician before beginning any treatment, even OTC. Camphor, menthol and eucalyptus oil possess anti-bacterial and anti-fungal properties, which impedes the growth of fungus of nail and eventually results in its weakening. All these ingredients present in Vicks vaporub work in harmony and destroy nail fungus. After the fungi is completed killed a new nail grows in and pushes your infected nail out. You should keep in mind that for Vicks vaporub to work you have to use it consistently. What Is the Opinion of Research on the Effects of Vicks Vaporub on Toenail Fungus? The research that is most commonly referred to regarding effectiveness of Vicks is from Journal of American Board of Family Medicine. 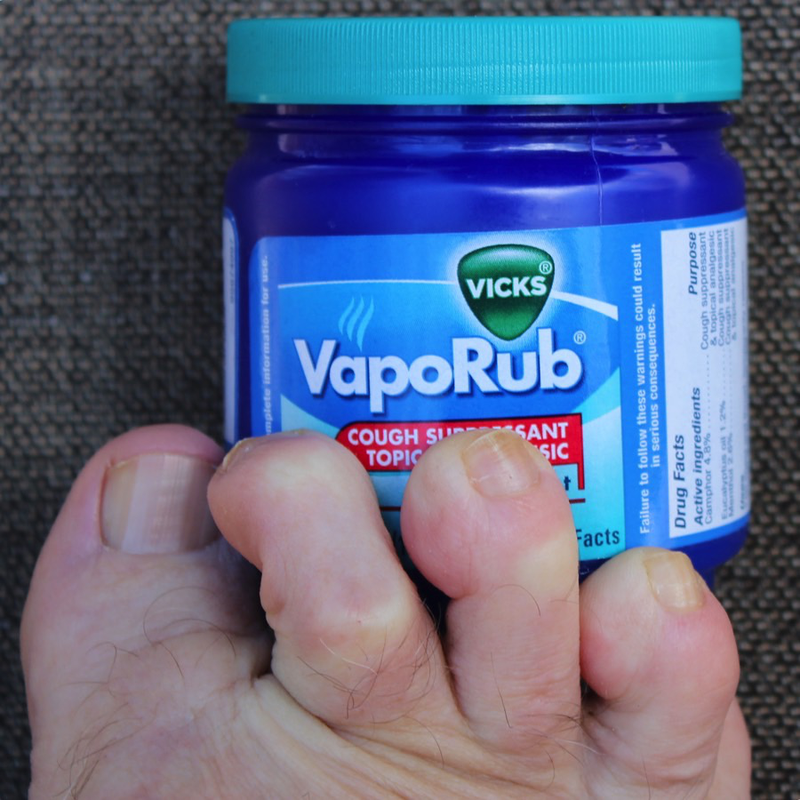 The study had 18 participants who used Vicks vaporub on their toenails every day for duration of 48 weeks. At the end of study, complete cure was seen in five participants and partial relief was seen in 10 of them. Relief from toenail fungus was obtained in 83% of participants. In another study published in Journal of Association of Nurses in AIDS Care, Vicks vaporub was used by 18 subjects for duration of 24 weeks. The participants were AIDS patients suffering from fungal infection of nails. These patients had suppressed immune systems and they cannot take drugs including Sporanox or Lamisil. By the end of study, 15 patients had improvement in the nail fungus and they had no adverse effects. Trim your toenail affected with fungus. Immediately post trimming, clean the nail clippers using hot water containing soap and rinse them using rubbing alcohol. Wash the foot. While washing, pay special attention to your infected nail. Dry the foot thoroughly using a towel. Take out Vicks from the container using a spoon. Make sure that you use spoon to take out Vicks because you may contaminate the Vicks in the container by applying it with your finger and then sticking the same finger back in the container. Apply Vicks from the spoon to the infected toenail. Make sure to cover the toenail completely with Vicks getting in the cuticle and beneath the nail. You may utilize a cotton swab or disposable ear bud to get Vicks beneath the nail and in edges of nail. Make sure to rub in Vicks thoroughly. Then cover your toe with a sock or bandage. This helps in absorbing the Vicks and prevents it getting rubbed off on furnishings or sheets. Usually there are no side effects reported when Vicks vaporub is used as a treatment for nail fungus. Some people may have a mild sensation of warmth but that is all that is reported. It is recommended to apply Vicks vaporub for toenail fungus two times daily, in morning and at night. If two times a day results in any kind of side effect, you may reduce it to once daily. Unfortunately, Vicks vaporub may take long before results are seen for your nail fungus. This is a major downside of using this product. It may take few months to a year before you start seeing results. Can Vicks Vaporub Be Used During Pregnancy? It is not recommended to use Vicks vaporub for toenail fungus during pregnancy. Instead, you can opt for other remedies available at home including vinegar. Your physician may prescribe oral or topical antifungal drugs. Oral antifungal drugs. They are used initially as they help in clearing the infection quickly in comparison to topical drugs. Some of these are itraconazole (Sporanox) and terbinafine (Lamisil). They help in the growth of a new non-infected nail which replaces the infected nail slowly. This drug is taken for 6-12 weeks. However, the infection may take 4 or more months to get eliminated. The success rate of treatment is less in adults greater than 65 years of age. The side effects of these drugs range from rash of skin to damage to liver. You may require periodic blood tests while you are on these drugs to know the status of your organs. These drugs are usually not recommended for people suffering from congestive heart failure, liver disease or those who are on certain medicines. Nail polish (medicated). You may be prescribed a nail polish (antifungal) referred to as ciclopirox (Penlac). You are required to apply it to the infected nail and surrounding skin one time a day. After a week, you have to wipe piled on layers of nail polish with alcohol and then apply fresh nail polish. You have to do this for about one year. Medicated cream for nail. You may be prescribed a cream (antifungal) which you have to rub in the infected toenail after soaking your nail. They work better on thin nails as this helps in getting the medicine to the fungus lying beneath the nail surface. For thinning of nails you have to apply a lotion that contains urea to your nails. Your physician may also debride the nail surface using a file. Your physician may suggest removing the nail temporarily so that they can apply antifungal medicine directly to infection beneath the nail. Certain fungal infections of nail are non-responsive to drugs. Your physician may suggest permanent removal of nail in case the infection causes extreme pain or is severe.